New interface elements, including an editable library of metal decks, make it easy to accurately model, analyze and design composite floors with no practical limitations in floor geometry or loading. Composite decks in Scia Engineer v14.1 can be modeled as a plate (concrete topping + steel deck) with eccentric ribs (steel beams). This integration allows for the automatic calculation of beam effective width as well as orthotropic stiffness of composite slabs, which is necessary for both construction and final composite stage design calculations. The design check, which is written in Scia Design Forms, is completely transparent. You can see and verify the formulas used to derive the check while the detailed output is automatically included in Scia Engineer and the Engineering Report. 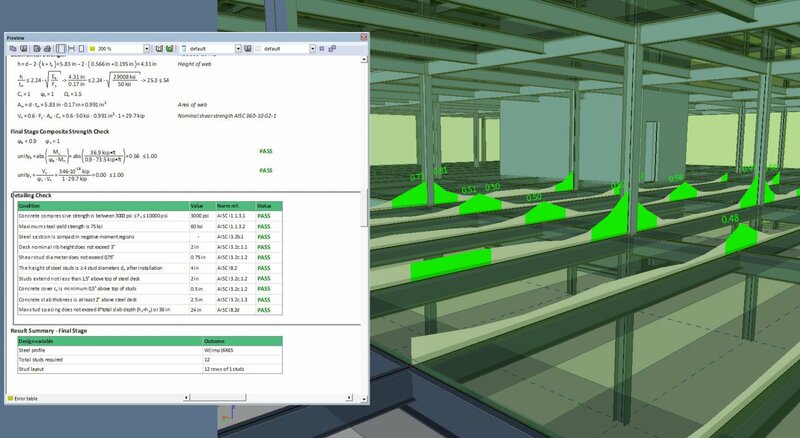 The new composite analysis and design functionality within Scia Engineer v14.1 allows engineers working in an FEA environment to easily and accurately model, analyze and design composite floors according to AISC 360-10 and overcomes many of the modeling limitations found in traditional steel design software.